What Is DA Form 7223-1? DA Form 7223-1, Base System Civilian Performance Counseling Checklist/Record is a form used during counseling performed as a part of the Total Army Performance Evaluation System (TAPES). The form is used as a tool for discussing and documenting personal job expectations and individual achievements of civilian employees within the U.S. Army. The latest version of the form - sometimes incorrectly referred to as the DD Form 7223-1 - was released by the Department of the Army (DA) in August 1998. An up-to-date DA Form 7223-1 fillable version is available for download and digital filing below or can be found through the Army Publishing Directorate website. The counseling checklist is closely related to the DA Form 7223, Base System Civilian Evaluation Report, used for recording the results of the evaluation and the rated employee 's achievements throughout a certain period. The DA 7223-1 should only be used with a copy of the corresponding DA 7223. How To Fill Out Da Form 7223-1? initial in the block provided. You may attach additional pages. 2. Give the Ratee the form to review/initial. 3. If the Ratee gave written input, attach it. cannot be resolved in time for improvement before the next annual rating. performance counseling and recording counseling content/dates. rating period and again at the midpoint of the rating period. and effectiveness of any completed training. 2. Review notes from the last session. 3. Consider whether priorities or expectations have changed. 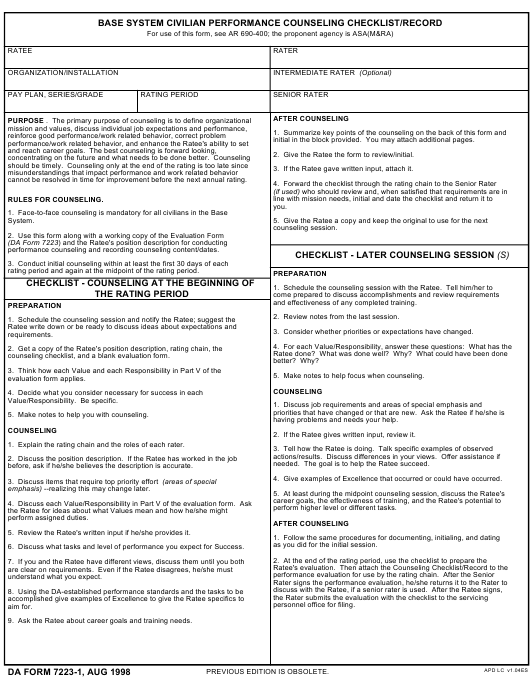 counseling checklist, and a blank evaluation form. 5. Make notes to help focus when counseling. 5. Make notes to help you with counseling. having problems and needs your help. 2. If the Ratee gives written input, review it. 1. Explain the rating chain and the roles of each rater. needed. The goal is to help the Ratee succeed. before, ask if he/she believes the description is accurate. 4. Give examples of Excellence that occurred or could have occurred. emphasis) --realizing this may change later. perform higher level or different tasks. 5. Review the Ratee's written input if he/she provides it. as you did for the initial session. 6. Discuss what tasks and level of performance you expect for Success. 9. Ask the Ratee about career goals and training needs. timely/appropriate personnel actions. Recruits/retains quality force. the work. Produces expected quality and volume. Meets deadlines. on expectations, performance, and career goals; evaluates timely. Works with right amount of supervision. Gets desired results. Resolves conflict and maintains order. to do business. Seeks/accepts developmental opportunities. member, works well with group and helps others get the job done. Expresses ideas clearly. Follows instructions or asks for clarification. emphasis to the execution of the Affirmative Employment Plan. Shows respect and is courteous. Shows concern for customer. Participates in EEO/AA activities and encourages subordinates to do so. Face-to-face discussions are a mandatory activity for all civilians included under either the Base or the Senior systems. The initial counseling should be conducted strictly within the first 30 days of the rating period. The seven lines at the top of the first page of the form should be completed with data about both the evaluated employee and the rater. The required information includes the full name of the rated person, the name of their organization, their pay plan, and rating period, as well as the names of all of the raters involved. In addition to the main rater and intermediate rater and senior rater can be included in the evaluation process if necessary. During the counseling, the rater will bring up and discuss the employee's job description, their areas of special emphasis, their views on assignments and the criteria for success. The rated employee must understand what is expected of them and be aware of both their achievements and any pitfalls that may have happened already. Each session must be recorded on the form. Each entry should contain the date of the discussion, the ratee's and rater's initials and the key points made during each counseling session.